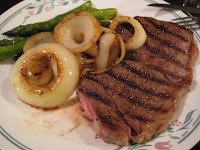 The Traveling Food Critic: My Comfort Meal - a big ol' Ribeye steak! My Comfort Meal - a big ol' Ribeye steak! There's nothing like a good steak. I, myself, prefer the Rib-eye, or you might also see it labeled as "Delmonico." It's a pretty fatty cut, which means it has great flavor, but boy does it pack a lot of calories. It's also fairly tender, so you end up with a juicy lusciousness that's so hard to find elsewhere. I purchase my steaks from Costco. They're beautifully marbled and good looking, generous portions that are far less per pound than anywhere else. I know, I know, what about the leaner, more eco-friendly, organic grass-fed beef you've been talking about, Lina? And truly, when I think about why the meat is so well-marbled - cuz the cattle is so fattened up with grain that the fat begins to disperse into the muscle tissue - I just know there's a lot of no good going on. But, alas. I have an illicit love affair with fatty, marbled grain-fed steak. The thing about Costco steaks is that they're so huge. Before I do anything, I cut them latitudinally so that I end up with steaks that are half the thickness. I find that an inch-thick steak is perfect. Seasoned minimally with salt, pepper, and some garlic powder, 4 minutes on each side should do the trick for Medium Rare steaks. When I take them off the pan to rest, I throw in my asparagus and sweet onions to get some grilling action on them, too. Olive oil, salt and pepper, that's it.